Snooper Truckmate Pro S6800 features a large 7-inch slim wide touchscreen, Bluetooth for handsfree calls and provides FREE TMC Traffic information. Plus via subscription the S6800 Pro can also provide advanced warnings to speed camera locations. The S6800 also includes a Tyre Pressure and Temperature Monitor. The S6800 also features Lane Guidance and Junction View to help guide you and your lorry or other large vehicle along your route with turn-by-turn voice directions. The S6800 is preloaded with European maps which are free to update for the lifetime of the product. Snooper S6800 Truckmate Pro Europe has been discontinued. Snooper Truckmate Pro S6800 is a portable 7-inch satellite navigation system which has been designed for drivers of trucks, HGVs and other commercial vehicles. The Snooper S6800 truckmate sat nav features a large 7-inch touchscreen, Bluetooth and built-in FM transmitter. The Truckmate S6800 uses the latest here mapping and is preloaded with UK and European maps. S6800 truck sat nav also provides advanced warnings to roadwork's, congestion and traffic jams and what's more these alerts are all FREE. The S6800 features TMC Traffic information which utilises the traffic master information network. The Truckmate 6800 works like a normal sat nav; you enter the address, postcode etc, for turn-by-turn directions to your destination. What makes it very different is that you can enter and save your trucks load, height, weight, width, length and the Snooper truck mate's preloaded software will then calculate the best route avoiding low bridges, unsuitable and too narrow roads, etc. Snooper S6800 Truckmate Pro Sound truck sat nav is the result of more than 5 years of development of the Snooper truck mate range. Research has shown that truckmate users will save money over time. By using Snooper satellite navigation to find the shortest or most economical route you will save 16% fewer miles driven on each journey and thus also a 16% saving in fuel expenses making this Snooper Truckmate pay for itself. 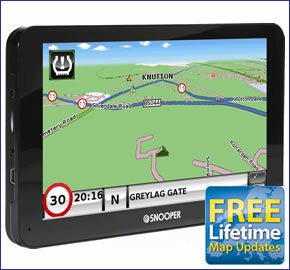 SPECIAL OFFER: Buy the S6800 Pro or any other Snooper truck sat nav model from ActiveGPS and receive FREE lifetime map updates worth over £100. The annual road map updates are by here. Details of the offer and other models that include the FREE lifetime map updates can be found here. 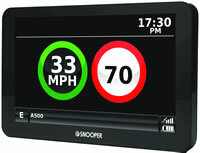 Snooper Truckmate S6800 Pro lorry sat nav on-board features include Junction View and Lane Guidance. These features make it clear what lane you need to be in at each junction providing you with plenty of warning. To make your current location clearer and to highlight where you are heading this truck sat nav can also increase the size of road names and numbers displayed on the 7-inch screen. The Snooper S6800 has a point of interest 'corridor' search which will inform you of points of interest along your predetermined route. Additionally the S6800 sat nav system includes AdBlue Filling Station Points of Interest. This feature allows you to find your nearest petrol station. There is also a route timer that can be set to alert you when it is time to take a break on your journey. Truckmate S6800 includes as standard My Speed information meaning it will tell you the speed limit of every road regardless of whether there is a speed camera there or not. You can get speed limits for lorries over 3.5t. The Truckmate S6800 will also alert you if you exceed the speed limit protecting your driving licence. The Truckmate can also be optionally updated to include Snoopers’ Aura Database of speed camera locations. Click here to read more about the AURA speed trap database. Snooper S6800 Truckmate Pro mounts on the inside of your vehicles windscreen using the suction cup windscreen bracket provided. Snooper S6800 Truckmate Pro can be powered directly either from its internal battery if it's fully charged or powered from the cigarette lighter socket. Snooper S6800 Truckmate Pro provides advanced warning of all fixed speed cameras, SPECS and many laser sites using Snooper's AURA speed trap database. There are 3 easy ways to pay using a credit or debit card. The Snooper S6800 Truckmate comes supplied with everything you need to use it in your car (see What's in the box? above), however replacement and additional S6800 accessories are also available to buy from ActiveGPS. Question: I currently have the Snooper truck mate 6800 and looking to upgrade to the Snooper truck mate 6810 or the Garmin dezl 780. Which in your advice is the better truck nav? Answer: The Garmin dezl 780LMT-D is the newer of the two truck sat navs - coming into stock on Friday 1st June 2018. Both Snooper and Garmin sat navs use the same HERE maps, so routing, bridge heights, etc will be the same on both devices. Snooper uses the FM signal for free traffic information, while Garmin use the more advanced digital DAB signal for free traffic information. For more differences I would recommend you view the truck sat nav comparison table. I would also recommend you view the PDF manuals (located at the bottom of the product page in the "technical specification" section), so you can learn more about and read about the differences between the two sat navs. Do you have a question about the Snooper S6800 Truckmate? Submit your question via our contact page.